Our cages are all made right here on our Virginia farm, so there's no middle man. We only use materials that are made in the USA, and we designed the cages to be comfortable for the animals as well as easy for the owner to clean. We also offer easy-care accessories such as top-filling water bottles, automatic feeders, and comfortable cage mats. The wire we use on our cages is a very sturdy 14-gauge grid that is easy on your pet's paws, but it lets all of the waste fall into the tray so the animal stays clean and dry. Unlike slide-out trays, which are always lower and smaller than the cage floor, our sturdy, rustproof plastic trays act as urine guards by extending above the floor of the cage and keeping everything inside. We stock styles designed especially for rabbits, guinea pigs, ferrets, and birds, but we also make custom cages and have built cages for many kinds of animals including monkeys, hamsters, reptiles, pet rats, dogs, and cats. This cage is ideal for traveling, taking a baby bunny inside for the night, aiding in litter training, or keeping a rabbit with run-of-the-house out of trouble while you are away. Note the tray extending up above the floor to keep all of the waste inside. The cage is attached to the tray via spring hooks, so you can carry it all as one unit, and the springs simply unhook to empty the tray. We can add a sturdy balcony for bunnies to leap up to for $6, which provides them with a good view of their surroundings and better exercise than simply hopping around the cage. To cover any rough edges, the door opening (and edge of the balcony, if you would like one added) are trimmed with smooth plastic doorguard which comes in your choice of red, blue, or purple. If the cage will be used for longer than a short car trip, you may want to add accessories such as a feeder or water bottle, which can be purchased separately. This is our most popular rabbit cage. A good size for one small rabbit, or a larger one if it is let out to play often. Note the tray extending up above the floor to keep all of the waste inside. The cage is attached to the tray via spring hooks, so you can carry it all as one unit, and the springs simply unhook to empty the tray. It includes a sturdy balcony for bunnies to leap up to, which provides them with a good view of their surroundings and better exercise than simply hopping around the cage. To cover any rough edges, the door opening and edge of the balcony are trimmed with smooth plastic doorguard which comes in your choice of red, blue, or purple. Oreo, our Black Broken Mini Rex in the photo on the left, is not included. 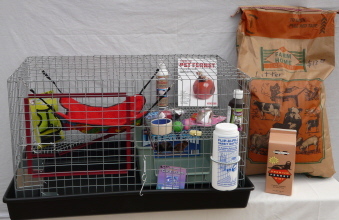 The setup shown on the right includes everything you need for a new bunny, including an automatic feeder installed wherever you would like it, top-filling water bottle, litter pan, ten pounds of food, a 50-pound bag of litter for the tray and litter pan, a mat to sit on, chew block, hay, organic bunny salad, and edible toys. If you don't need the whole setup, any of these accessories can be purchased separately or removed from the setup. This cage is a good size for one larger rabbit, or two small bunnies, if they are let out to play often. Note the tray extending up above the floor to keep all of the waste inside. The cage is attached to the tray via spring hooks, so you can carry it all as one unit, and the springs simply unhook to empty the tray. It includes two sturdy balconies for bunnies to leap up to, which provides them with a good view of their surroundings and better exercise than simply hopping around the cage. To cover any rough edges, the door opening and balcony edges are trimmed with smooth plastic doorguard which comes in your choice of red, blue, or purple. Melissa, the black Dutch doe in the photo on the left, is not included. The setup shown on the right comes with everything you need for a new bunny, including an automatic feeder installed wherever you would like it, top-filling water bottle, litter pan, 10 pounds of food, a 50-pound bag of litter for the tray and litter pan, grass mat, chew block, organic bunny salad, toys, hay, & snacks. If you don't need the whole setup, any of these accessories can be purchased separately or removed from the setup. Our largest stock size of rabbit cage, although we have made much larger custom cages. Plenty of room for one rabbit of any breed, two medium-sized bunnies, or even three dwarves. 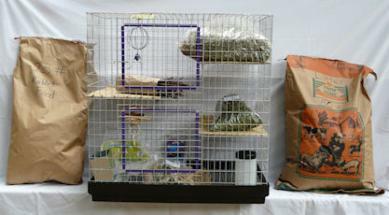 This is also a very popular cage among chinchilla owners, as chinchillas enjoy hopping just like rabbits. Note the tray extending up above the floor to keep all of the waste inside. The cage is attached to the tray via spring hooks, so you can carry it all as one unit, and the springs simply unhook to empty the tray. It includes three balconies for animals to leap up to, which provides them with a good view of their surroundings and better exercise than simply hopping around the cage. To cover any rough edges, the two door openings and balcony edges are trimmed with smooth plastic doorguard which comes in your choice of red, blue, or purple. Mariah, our model Fawn Mini Lop, is not included. The setup shown on the right includes everything you need for a new bunny, including an automatic feeder installed wherever you would like it, top-filling water bottle, litter pan, 25 pounds of food, a 50-pound bag of pelleted soy litter for the tray and litter pan, mats for the floor and each balcony, hay, chew sticks, organic bunny salad, hay feeder, and assorted toys, and more. If you don't need the whole setup, any of these accessories can be purchased separately or removed from the setup. A good size for one small rabbit, if it is let out to play often. Note the tray extending up above the floor to keep all of the waste inside. The cage is attached to the tray via spring hooks, so you can carry it all as one unit, and the springs simply unhook to change the tray. It includes a sturdy balcony for bunnies to leap up to, which provides them with a good view of their surroundings and better exercise than simply hopping around the cage. To cover any rough edges, the door opening and edge of the balcony are trimmed with smooth plastic doorguard which comes in your choice of red, blue, or purple. Rocky Road, our adorable Harlequin Mini Rex in the picture on the left, is not included. The setup shown on the right comes with your choice of the 18" x 24" cage, shown left, or the 18" x 30" cage, shown right, for the same price. The setup includes a top-filling water bottle, food bowl, ten pounds of food, a mat to sit on, chew block, hay, and edible toys. If you don't need the whole setup, any of these accessories can be purchased separately or removed from the setup. This popular cage was designed with guinea pigs in mind, but it has also been purchased for hedgehogs and pet rats. Plenty of room for one or two guinea pigs, or even three if you let them out to play often. We designed the guinea pig cages without wire floors, as their feet are not furry and therefore better suited to a solid floor. The cage is attached to the tray via spring hooks, so you can carry it all as one unit, and the springs simply unhook to empty the tray. It includes a 30"-long balcony, two 18" balconies, a curved bridge, and a ramp for easy access. Climbing multiple levels provide the piggies with a good view of their surroundings and better exercise than simply walking around the cage. To cover any rough edges, the door opening, ramp, curved bridge, and all of the balconies are trimmed with smooth plastic doorguard which comes in your choice of red, blue, or purple. The setup shown on the right comes with everything you need for a new guinea pig, including an automatic feeder installed wherever you would like it, top-filling water bottle, five pounds of food, hay, a huge bag of pine shavings for the tray, a mat for each balcony, a hide-away hut, organic salad and snacks, and a hay dispenser. If you don't need the whole setup, any of these accessories can be purchased separately or removed from the setup. This is our most popular ferret cage. Plenty of room for one adult ferret, if you let them out to play often, and makes a good guinea pig cage, as well. We designed the ferret cages so that the animals cannot fall from a high balcony all the way to the floor, as they can with other manufacturers' designs. The cage is attached to the tray via spring hooks, so you can carry it all as one unit, and the springs simply unhook if you need to clean the cage. It includes an 18" by 13" balcony with a ramp, and has an empty space to the left for the hammock to hang. To cover any rough edges, the door opening, ramp, and edge of the balcony are trimmed with smooth plastic doorguard which comes in your choice of red, blue, or purple. The setup shown above comes with everything you need for a new ferret, including an automatic feeder installed wherever you would like it, top-filling water bottle, 50 pounds of pelleted soy-based flushable litter, food, litter pan, a bowl for moist food, hammock, bell collar, and lots of other toys and accessories that can be selected based on your individual ferret's preferences. If you don't need the whole setup, any of these accessories can be purchased separately or removed from the setup. This cage has plenty of room for one or two adult ferrets, if you let them out to play often, and makes a good chinchilla cage, too. We designed the ferret cages so that the animals cannot fall from a high balcony all the way to the floor, as they can with other manufacturers' designs. The cage is attached to the tray via spring hooks, so you can carry it all as one unit, and the springs simply unhook if you need to clean the cage. It includes two full floors plus a balcony, with ramps to all levels for easy access. There is an empty space to the left of the balcony for the hammock to hang. To cover any rough edges, the two door openings, ramps, opening to the second floor, and edge of the balcony are trimmed with smooth plastic doorguard which comes in your choice of red, blue, or purple. The setup shown above comes with everything you need for a new ferret, including an automatic feeder installed wherever you would like it, top-filling water bottle, 50 pounds of pelleted soy-based flushable litter, food, litter pan, a bowl for moist food, hammock, bell collar, and lots of other toys and accessories that can be selected based on your individual ferrets' preferences. If you don't need the whole setup, any of these accessories can be purchased separately or removed from the setup. This cage has plenty of room for up to 4 adult ferrets, if you let them out to play often. We designed the ferret cages so that the animals cannot fall from a high balcony all the way to the floor, as they can with other manufacturers' designs. The cage is attached to the tray via spring hooks, so you can carry it all as one unit, and the springs simply unhook if you need to clean the cage. It includes three full floors plus a balcony, with ramps to all levels for easy access. There is an empty space to the left of the balcony for a hammock to hang. To cover any rough edges, the three door openings, ramps, all floor openings, and edge of the balcony are trimmed with smooth plastic doorguard which comes in your choice of red, blue, or purple. The setup shown above comes with everything you need for a new ferret, including an automatic feeder installed wherever you would like it, top-filling water bottle, 50 pounds of pelleted soy-based flushable litter, food, litter pan, a bowl for moist food, hammock or other sleepers, bell collar, and lots of other toys and accessories that can be selected based on your individual ferrets' preferences. If you don't need the whole setup, any of these accessories can be purchased separately or removed from the setup.